After building his lamp, Carmine felt enough of a master of glass building to attempt building some cabinet door panels to match his lamp. He designed and built the door panels below, on his own, with only limited guidance from his teacher. These are now installed with his new lamp in his kitchen. 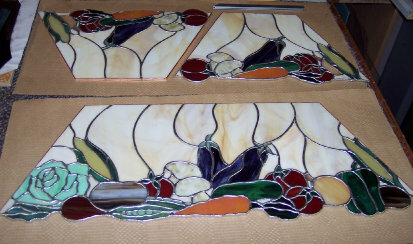 Carmine called me about building a vegetable lamp to hang in his kitchen. 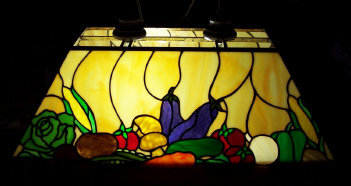 Decades ago I built a fruit lamp that still hangs in my kitchen......but I had never heard of a vegetable lamp. An internet search still didn't enlighten me, so I told Carmine ..."If you draw it, I'll build it." With a little coaching on drawing for stained glass, he came up with an interesting design. 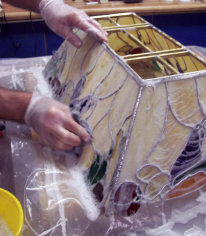 Carmine lives in my area and wanted to learn how to build stained glass, so he worked with me on building this lamp. 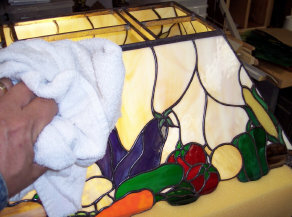 Carmine's vegetable lamp was designed much like a pool table lamp.... to go over a kitchen island work area. We designed it with 2 light bulbs to minimize shadows and an open top to let light shine up as well as down. 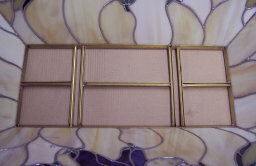 We had to build a special brass frame to hold the structure together. Carmine came up with an unusual hanging crossbar to add stability and came up with some arrow finials to finish his design. When we first started the project I thought Carmine was a little nutty, but his concept of a vegetable lamp actually came out quite well. Carmine's lamp measures 9 3/4" high, 24" long and 14 1/2" deep. 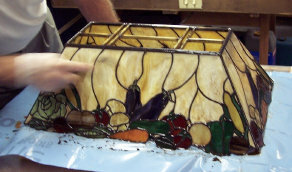 It contains 354 pieces of glass and was completed in January of 2010. 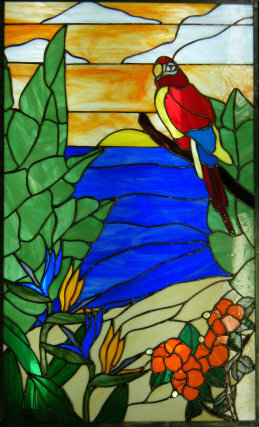 Carmine followed up his succesful kitchen project with a brightly colored tropical scene designed to fit his back door. His bold choice of colors worked well and he proved he has mastered the basic skills of strained glass construction. 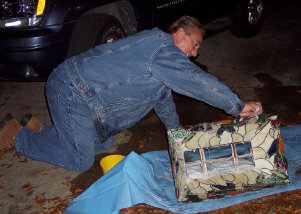 His tropical masterpiece measures about 22" x 36" and is presently installed in his back door. Looks like the student has done well! 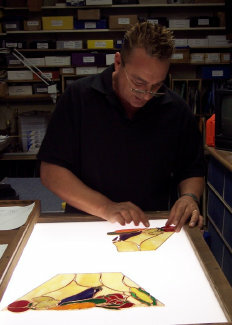 Carmine has continued to work with glass and in the last few months of 2011, he completed the windows below. 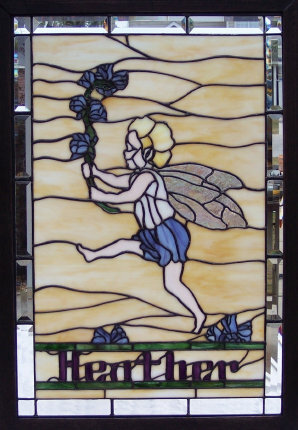 The Heather Fairy measures about 28" x 36" and the Alabama "A" measures about 14" x 19". These were both commission pieces so he is able to expand his inventory of tools and glass while he gains experience developing his talent. I think we will see many fine artistic glass pieces from Carmine in the future!